The Chinese influence on Sri Lankan territories is greatly felt as ties between the two countries are further strengthened through mega scale capital projects. With the Colombo Port City, the Mattala Airport and the Hambantota Port being constructed and developed by the Chinese Government, Sri Lankans and the international community are closely observing where the two countries are heading to. 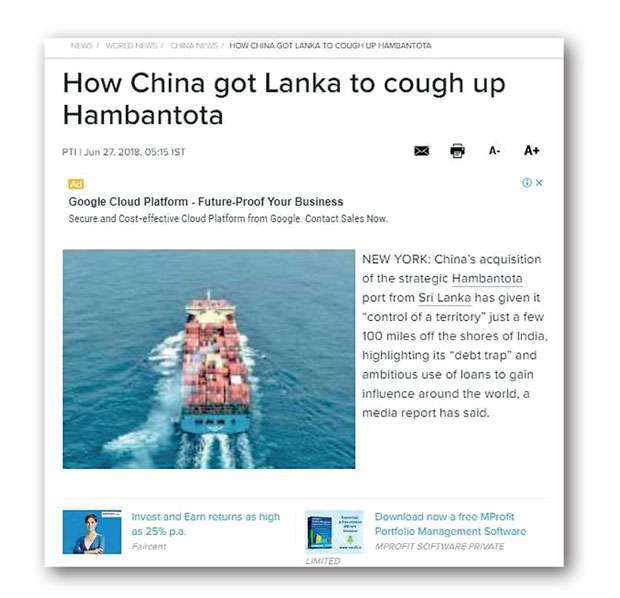 In a recent turn of events, an article revealing how China made Sri Lanka agree to establish a Port went viral on social and mainstream media. Several alarming facts were revealed through the article including sums of money exchanged for various transactions. It also highlighted the fact that former President Mahinda Rajapaksa’s election campaign was also funded by the Chinese Government. However the former President Rajapaksa has denied all allegations and claimed that the Government is engaged in a mud-slinging campaign. A statement released by former President Rajapaksa states that the NYT writer alleged that the initial loan of $ 307 million had been renegotiated to a 6.3% fixed rate after having been taken initially at a concessionary rate. The intention was to stress the point that China was lending at exorbitant interest rates. This initial loan was taken at the LIBOR (London Interbank Offered Rate) benchmark rate plus 0.75%. During that period, the LIBOR increased, pushing up the actual interest rate of the initial loan to 6.5%. It was then that a fixed rate of 6.3% was negotiated. However, the remaining $ 1 billion was taken from China at the concessionary interest rate of 2%. The writer states that the loans could have been taken from other countries at an even lower interest rate. However, in obtaining project loans, the interest rate is not the only criterion to be considered. 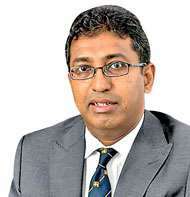 In reference to this, State Minister of National Policies and Economic Affairs Dr. Harsha De Silva disputed the reasons stated for negotiating the fixed rate at 6.3%. “It states that global interest rates were rising and therefore the actual interest rate was 6.5%. Contrary to his statement, at that time LIBOR was falling below 1% and while this was falling MR put in a cabinet paper and fixed the rate at 6.3%. Anybody could dispute me in this, but I have all the evidence to prove these facts and I have voiced this out over thrice in Parliament,”De Silva states. Speaking to the , Minister of Wildlife and Sustainable Development Gen. Sarath Fonseka said that when he initially gets USD 300 million, the interest rate is at 2%, but in the second quotient when he gets USD 700 million, the interest rate goes up to 6%. “When obtaining commercial loans, interest rates are lower, but in this case it is higher. It’s unethical and suspicious because the money eventually belongs to the people of this country. In fact US$ 700 million is a huge amount of money. 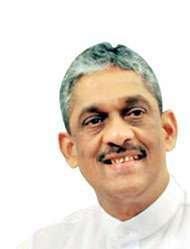 Therefore the Government should conduct a reasonable investigation regarding the facts pointed out in this article,” Gen. Fonseka said. In his comments State Minister of Finance and Mass Media Eran Wickramaratne said that in other countries there are laws which make it compulsory for political par ties to disclose their spending for a political campaign. “In many countries in the world, the sources need to be revealed. But Sri Lanka doesn’t have many rules or laws and therefore people aren’t doing something illegal. But it has become an ethical issue when it comes to borrowing money from questionable sources or sources under inquiry. The issue in this particular query is that it’s the first time that a foreign company has funded a Presidential campaign and in turn it undermines the sovereignty of the people. 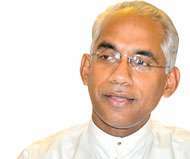 Obligation is controlled by having laws and I think it was in October when the Cabinet approved the drafting of a new law which provides control of election expenditures as it came from the President,”said Wickramaratne. He further said that projects such as the Mattala Airport will incur losses for a long time to come and financially they seem to be unviable. “In these kinds of projects both the lenders and the borrowers have a responsibility. Investment is mostly welcome by any investor into this country and there are several Chinese companies that have made very good investments. What I would like to say is that our Government is transparent and therefore we have asked for an investigation into this article. When a Government shows that it’s inclined towards good governance it gives room for good investors to come in,” he added. 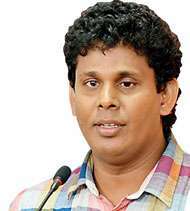 JVP Politburo member Wasantha Samarasinghe blamed the Government for not fulfilling its promises which were made three and a half years ago. “Hence the Government hasn’t done anything to curb malpractices and corruption. It’s wrong that MR received funds from China Harbour Co. and it is also wrong that the present Government is still warming their seats. They buy permits and receive their perks and benefits, but what is left for the people? The people are continuously burdened with debts while the politicians are engaged in their power struggle,”said Samarasinghe. 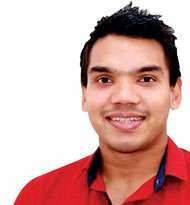 When questioned by the , former President’s son and Hambantota District Parliamentarian Namal Rajapaksa said that the entire article is inaccurate. “It says that they have got information from Government institutions such as the FCID, but how did a foreign journalist get information from the Government? They mention about a B Report, but w hat report did they refer to? “The article also mentions about not carrying out a feasibility study, but I would like to point out that there were two feasibility studies done; one in 2003 when Ranil Wickremesinghe was the Prime Minister and Mahinda Rajapaksa was the Opposition Leader and another study between 2004 and 2007 when President Chandrika Kumaratunga was in power. Both these studies confirmed that the Hambantota Port is a viable project for the country. It says that only 32 ships arrived in 2012, but this is in comparison to the Port that existed 10 years ago. But by 2014 over 300 ships have arrived at the Port. The article is proof that the New York Times history has spoken for itself. It is a respectable media organization, but this isn’t the first time they’ve published false news. On the other hand we totally deny the allegation that MR’s election campaign was funded by the Chinese Government,” he said. The article credited the efforts made by Sri Lankan journalists Dharisha Bastians and Arthur Wamanan in drafting the article. However consequent to the initial article, the New York Times issued a statement on July 3 stating that a group of Sri Lankan parliamentarians allied with the former President Mahinda Rajapaksa held a news conference to publicly criticise two journalists who contributed logistical assistance to a rigorously reported and accurate New York Times investigation in to the Hambantota Port. The article also mentions that a photograph of Dharisha Bastians was also produced in front of the cameras. It further states that this press conference came after a days-long campaign on social media to discredit the journalists. Under heavy pressure and after months of negotiations with the Chinese, the Government handed over the port and 15,000 acres of land around it for 99 years in December. 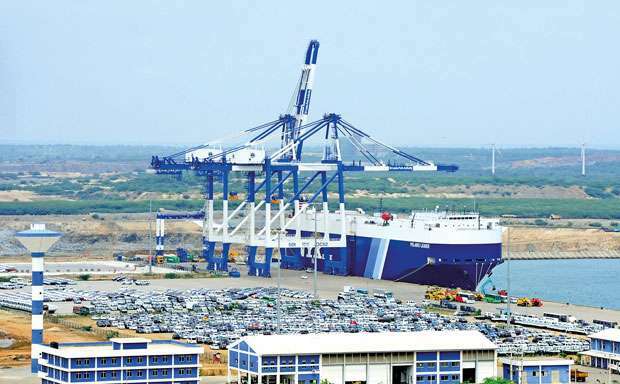 The first major loan the Sri Lanka Ports Authority obtained relating to the project came from the Chinese Government’s Export-Import Bank, or Exim, for $307 million. $297,000 to buy supporters gifts, including saris. Two cheques totalling $1.7 million were delivered by volunteers to Temple Trees, his official residence. Under Rajapaksa, the country’s debt had increased threefold, to $44.8 billion when he left office. And for 2015 alone, a $4.68 billion payment was due at year’s end. In a statement issued by former President Mahinda Rajapaksa he mentioned that the main allegation in this article – that $ 7.6 million had been given to him as campaign contributions by China Harbour Co. during the 2015 presidential elections – is based on a Reuters report that appeared three years ago in July 2015. According to the statement, “No contribution was made by China Harbour Co. to my 2015 Presidential Election Campaign. While claiming that my ‘affiliates’ and ‘campaign aides’ had got the money and that ‘volunteers’ had delivered the cheques to Temple Trees, the writer of the New York Times article has been intentionally vague about who had given this money and who had received it. The NYT writer has stated that they had obtained some of the details in that article from a Sri Lankan ‘Government investigation’. Every Sri Lankan knows that the main preoccupation of this Government since it came into power has been to sling mud at the opposition. The NYT writer states that the lease of the Hambantota Port gave China control of the territory close to the shores of India, and that India was now apprehensive about the uses that this Port may be put to. Such a situation would never have arisen if my Government had continued in power. The New York Times has described me as China’s preferred partner in Sri Lanka. Given what has taken place after 2015, I have no doubt that I am now the preferred partner of India as well. Several attempts made by the Daily Mirror to contact the Chinese Embassy failed. However in a statement issued by the Chinese Embassy to the media, it stated that this article was based on political prejudice and that it was inconsistent.